Why do the Earth and planet-like Moon share the same orbit with both celestial bodies held by the gravity force of the Sun? A famous science writer, Isaac Asimov, well before the Apollo missions, claimed that the Moon is definitely a planet lacking the basic property of satellites that are held in orbit by their parent planet. The Sun's gravity holds the Moon in its orbit and not the Earth's. The gravity forces are simply computed from Newton's famous equation: f = (G x M x m) / d2 and the "Tug of War" ratio of fPLANET / fSUN. Of all the significant satellites, only the Moon, at 0.46, has a ratio that is less than one. Furthermore, Asimov continues his argument that a true satellite for Earth should be between 29,000 miles, which is the minimum "Tug of War" ratio of 30 for all primary satellites and 9,600 miles which is based on the Roche limit where tidal forces break-up a closer orbiting object. Why is the Moon situated at 237,000 miles and inclined 5.1 degrees to the ecliptic and not in the Earth's equatorial plane? If the Moon was captured within an acceptable range, and then receded due to tidal energy losses it should still remain in the plane of the Earth's equator. The mass ratios of other planets to their satellites differ by as much as 100 to 1000 times more than the Earth-to-Moon mass ratio. The Earth-to-Moon's radius ratio of 0.2725 is almost a scale of 10 larger than the other radius ratios. 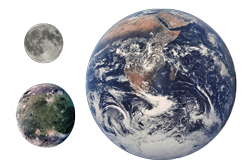 The mean density of the Moon compares more with its rocky terrestrial parent than the densities of the typical icy, silicate based outer planet satellites, which are comparable to their own parents. The Moon's orbit is everywhere concave toward the Sun or always falling toward the Sun; all other normal satellites without exception fall away from the Sun through part of their orbits being caught by the greater gravity force of their parent planet. The dilemma is how the Earth and its planet-like Moon fit into the greater scheme of the currently accepted nebular hypothesis. What possibly could be the origin of this system considering that all planetary orbits of the nebular hypothesis have but one planet? 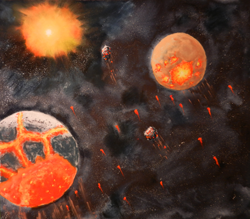 Earth as other planets supposedly formed from an accretion of rings of dust, gases, and larger and larger forming planetisimals orbiting inside the proto-star disk. This anomaly of both the Moon and Earth residing in the same orbit is essentially the Moon enigma. No amount of intuitive thinking or computer modeling of a nebular hypothesis produces an Earth-Moon system. The new Earth-Moon story of these journals begins with the young solar system already well established 700 million years after its birth. All the orbiting planets and their orbital locations were established approximately per the Titius-Bode Rule. In the Earth's current orbit resided only the Moon. In an orbit between Mars and Jupiter resided a terrestrial planet - call it Gaia. This planet as all other terrestrial planets was already differentiated with a hard crust. Gaia also had a significant amount of water and atmosphere sitting on top of its crust. A rogue, minor planet was either perturbed within the established system or recently captured by the solar system's gravity field. This rogue planet had an excessive elliptical orbit that crossed the almost circular orbits of the other planets and threatened collision at each crossing for each orbit. Eventually, the young Gaia with its very molten interior was struck by this rogue. 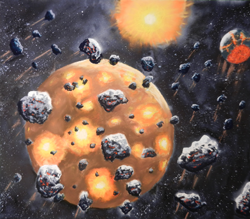 The collision gorged Gaia's almost liquid mantle, tilted Gaia's spin axis, ejected and oozed a mixture of mantle silicates and impactor volatiles creating a continent lying above or displacing Gaia's oceanic crust, cracked the existing crust in many places, and created debris in Gaia's orbit that is now called the Asteroid Belt. The kinetic energy of the collision did not destroy Gaia. The energy was transferred mostly to tilting its axis and changing Gaia's trajectory inward toward the Sun. As Gaia kept falling it gained speed until its centripetal force equaled the Sun's force of gravity near the existing Moon's orbit. Gaia found a new orbital location that it began sharing with the Moon. Debris that was carried along with Gaia was over a long period of time swept up by the Moon or fell back to Gaia. 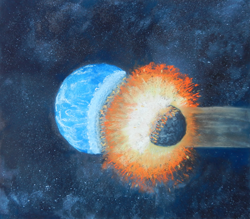 A higher amount of collisional debris and a larger frequency of impacts occurred on the Moon and other celestial bodies shortly after Gaia's collision to produce what planetary scientists call the Late Heavy Bombardment (LHB) period. 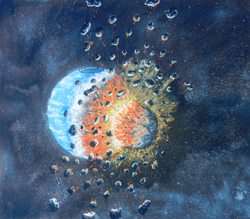 The story is almost complete except for some interactions between the two planets as they slowly became synchronized. Of course, Gaia is now very recognizable as being our home planet which will now be called Earth. As the faster Earth keeps passing the Moon with each orbit, energy is exchanged to move the Moon farther away and tidally lock one face toward Earth. The Earth's orbit becomes more rounded and slows to match the orbital velocity of the Moon. This journal will supply evidence for this new hypothesis of our violent genesis. 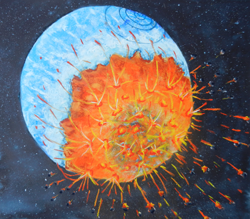 This new hypothesis is given the name, Earth's Metamorphosis (EMM), and counters the old nebular hypothesis in many ways and the recently accepted idea of an Earth collision that created debris which accreted to form the Moon. The biggest difficulty for the Earth's Metamorphosis Hypothesis is the issue of the reason and source for the Rogue Planet that struck Earth. This search, prior to the Nice Theory introduction, led to different ideas about the formation of our solar system and star systems in general. 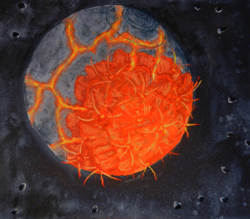 Two other hypotheses are proposed: the Collocation of Stars and Planets (CSP) and Supernova Seeding (SNS). These processes then led serendipitously to other proposals in these journals: the evolution of star types, the evolution of galaxies, and a source and reason for Dark Matter.